This week, several of my colleagues and I had the pleasure of welcoming to the Getty Villa the Minister of Culture and Tourism for the Hellenic Republic, Pavlos Yeroulanos. 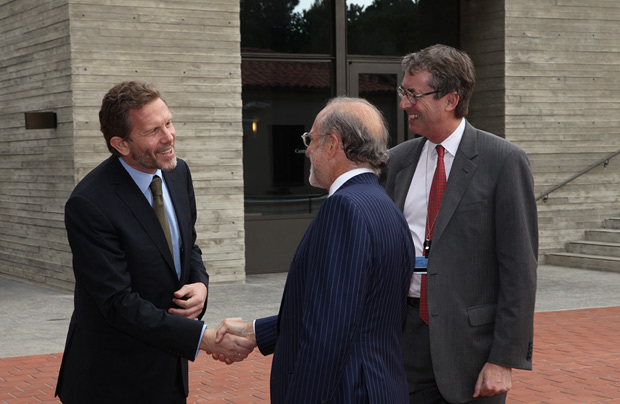 The purpose of his visit was to join our President and CEO James Cuno in signing a landmark agreement that creates a long-term partnership between Greece and the Getty. This is a moment that the Getty has been working toward since 2007, and one that complements agreements we already have with the Italian and Sicilian ministries of culture. 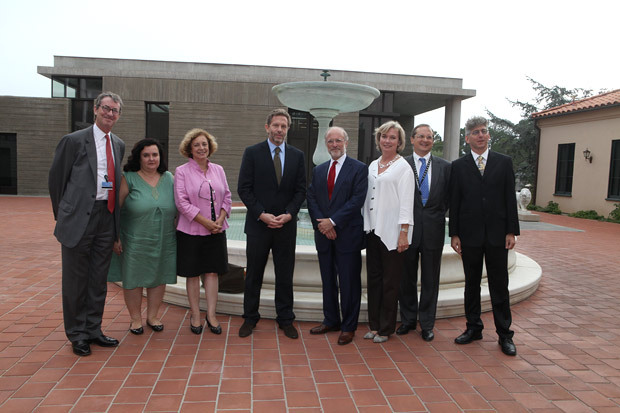 As the Getty has successfully done with our colleagues in Italy, this agreement formalizes our commitment to help conserve and present Greek cultural heritage. 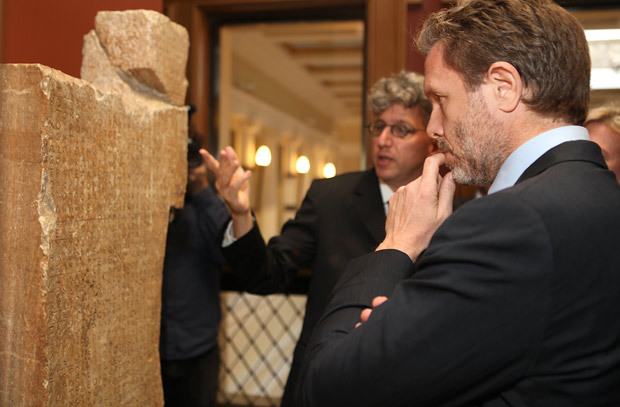 As part of the agreement, the Getty Museum will also transfer two objects to the Ministry—fragments of a grave marker that will be reunited with other pieces from the same work in Athens, and a marble building stone bearing ancient Greek script that has a unique historical relationship to the site of Thorikos. Both objects have strong ties to Greece, and our curators and board of Trustees agreed that returning them will serve the best interests of scholarship. Following the signing of the agreement, we had the opportunity to walk Minister Yeroulanos and his colleagues around the Villa. Because there was a matinee of Trojan Women (after Euripides) for college and high school students that afternoon, the group was able to catch the closing moments of the performance. Before the question-and-answer session with the cast of the play, I invited Minister Yeroulanos to address the students. He quickly explained that the Greeks were not the ones responsible for the Trojan War, and commented how delighted he was that Greek theater was being celebrated at the Getty. Reflecting on the day’s events, I was reminded that, in these complex negotiations and discussions about cultural collaborations and patrimony, we all share a common goal—to heighten awareness and appreciation of our shared cultural past and use it to educate our lives today. For our friends in Greece, I am hoping this agreement will mark a new beginning in that endeavor alongside their friends here at the Getty. In October I will be traveling to Athens along with James Cuno and Claire Lyons, our acting senior curator of antiquities, where we will explore further the concepts laid out in our newly signed agreement. What this will mean is that visitors to the Getty Museum can expect to see a number of beautiful loan objects from Greece, as well as exhibitions that will give us all a better appreciation of Greece’s rich artistic heritage. The Greek delegation with colleagues from the Getty; to Jim’s left, Claire Lyons, Stephen Clark, and Kenneth Lapatin. 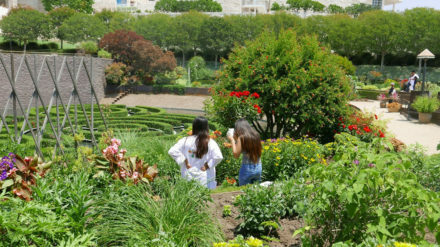 I'm acting director of the J. Paul Getty Museum. Before coming to the Getty as associate director for collections in 2007, I was senior restorer of paintings at the National Gallery in London. I hope British Museum follows.